On March 17 2006, I began my first deck plan for this project. Actually it wasn’t even a project yet. It was more of an experiment that slowly evolved into what you see today. Back then, I just knew I loved this ship and wanted to explore it. I had no idea of the odyssey that lay ahead. Along the way I have made a lot of friends, met so many new people, closely interacted with other fans, chatted with a few of my heroes, learned a hell of a lot about Photoshop and broke down my own barriers with web design. This has been a huge journey, one that I have enjoyed, hated and learned to love intensely. And now, five years later, I come baring the last of the schematics, my pièce de résistance. Right now, as I type this, the Cutaway schematic is being uploaded to the website server. When the indicator bar reaches 100% and the program singles the okay, an era is over for me, that one last mouse-click will close a door on a part of my life. To say that I am sad would be an understatement. This project has helped me through some of the darkest times in my life. Now it is time to set it free and let it fly on its own. As for the Cutaway schematic, I am very pleased with how she turned out. The obscene amount of detail I crammed into her is a testament to my obsession with this ship. You can also see I followed the same basic format as the previous version and did a view from the side and another from the front. I think that combining both together gives people a better understanding of the elevations and how everything relates. I hope you enjoy it. I also hope it lives up the hype. 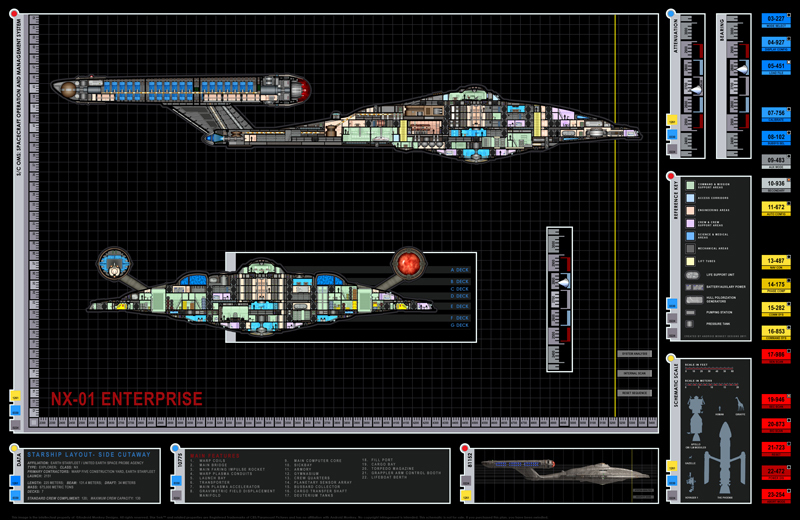 The full schematic can be viewed on the NX-01 Overview Page of the website. Well folks, it’s been fun and I hope to see everyone around. The blog will remain active for the time being. I plan on finishing the Companion next and I will be blogging about it. As for the Deck Plans and schematics, this is the end of the line… and out of her embrace this world is just a parking space. Your five year mission is over Captain. You’ve earned some shore leave. I second that. These plans are magnificent and they really bring the ship to life for me. I thought for some time they were official! When I was a child I used to spend hours drawing up plans for some imaginary craft that I made up. I never thought someone would do exactly the same for an Enterprise! Well done, and my utmost gratitude. Wow what a journey. Thank you for the stunning plans. If ever you decide to make them into an iPad app I would purchase it. Well, seems it’s over for the deck plans. Another great piece. If you ever start to get bored, here’s an idea: The Outer views of the Enterprise, you know? Dorsal view, ventral, fwd, aft? Only then from outside the ship! Then it’ll be complete. But, it has been great! You’re the best! I’ve been on the road for the past couple of months and now that I’m back, I’m excited to see your plans finished. Congratulations on the end of an era. I’m sure you’ve got a lot of mixed feelings and must have also dreaded this day. So here’s how I see it. You’ve created a fantastic piece of work. Not just did you come up with incredibly elaborate plans for something the size of ten football fields, a pixel for every square centimeter, but you kind of brought to life a work of fiction in a way that no one else has ever done before you. It’s non-essential, alright; kind of nerdy, definitely; but let’s face it… it’s an extraordinary piece of art that has no equal. Hats off! I wish you all the best of luck. A thousand thanks for sharing with us. Which to a problem that most I don’t think have fully realized. Ships would tend to get more massivivly built over time, as it would be found out that older ideas weren’t good enough to survive out there. So ship hulls would be built tougher and tougher, with time. That number is one that I came up with on my own. I hate the 80,000 number. It is just way to small for the size of the ship. Using that number would mean the ship weighs less than the Enterprise Aircraft Carrier! Canon or not, it just doesn’t work. It is a bad number and I chose to throw it out. My figuring is that as time goes on, yes indeed material improvement do occur. But higher warp speeds place more stress upon the hull et el. And that nature is always providing nasty surprises to starship crews. This means that, in essense that warp field is trying to pull/rip the ship apart in all directions. So ships have to be built strong, Then they have to be built to last. The Enterprise-D is designed to last one hundred years… The NX-01, I don’t think it was ever said, but assume two things, it was over optimistic, based upon limited understandings… And the second is that there were tech limitations. Many many congratulations for the super job you’ve done in recent years and especially thanks for sharing it with us and for allowing us to continue to dream with you. I hope you find time and motivation to continue creating these true works of art, as he said Jadin. Been doing some more thinking. You still have at least one thing to do. A single computer core modual. That is right, just a single one. So pull it out of B, C, or D decks. Why? Because there is still something to explain. Why would Trip take so long to change a Transtator? I have to agree. While is only through computer images, you have construct this ship. From the hull plating to the power conduits, you have built this ship. And just like an Engineer at a floating shipyard, you had problems and upgrades. She is a beautiful ship. Something to be proud of. I hope you come up with even more ideas. Your work is incredible and I look forward to see more of it. Now you just need to convince the DoD to build it according to your specifications, so you can see your blueprints realized in the real world.